Psydrax odorata, known as Alaheʻe in Hawaiian, is indigenous to the Hawaiian Islands and found in habitats that vary such as shrubland to dry, mesic and wet forests from about 30 to over 3,800 feet. Belonging to the Coffee family (Rubiaceae), alaheʻe is locally renown for its wonderfully fragrant flowers and very hard, durable wood. The generic name Psydrax is derived from the Greek word for blister or bump in reference to the warty fruit or the pimply seeds of some species in this genus. 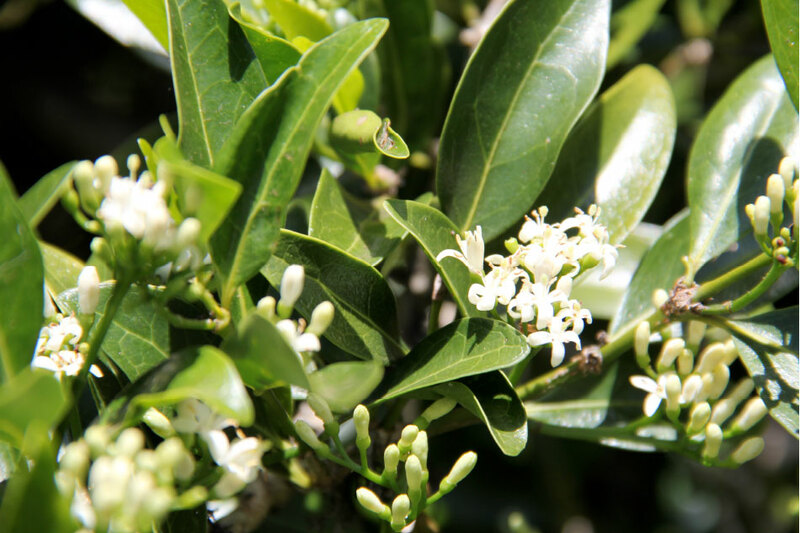 The specific name odorata is from the Latin odoratus, fragrant, referring to the sweet smelling flowers. The Hawaiian name alaheʻe means, “slippery like the squid (octopus).” Ironically, spears were fashioned for capturing heʻe (octopus) and were often made from alaheʻe. Reportedly a dark brown or black dye was produced from the leaves of alaheʻe by early Hawaiians. Spears, from 6 to 13 feet long, were fashioned for capturing heʻe (octopus) and were often made from alaheʻe. The hardwood was used for farming tools such as ʻōʻō, fishhooks, shark hooks (makau manō) with bone points, short spears (ʻo), and dip nets for fish and crabs. The wood was also made into adze blades for cutting softer wood such as wiliwili and kukui. Medicinally, the leaves and “the white skin of the stem” are prepared by cooking and the bitter medicine is drunk to cleanse the blood. One older source (Charles Gaudichaud,1819) states that Hawaiians “used all fragrant plants, all flowers and even colored fruits” for lei making. The red or yellow were indicative of divine and cheifly rank; the purple flowers and fruit, or with fragrance, were associated with divinety. Because of their long-standing place in oral tradition, the leaves and flowers of alaheʻe were likely used for lei making by early Hawaiians, even though there are no written sources.